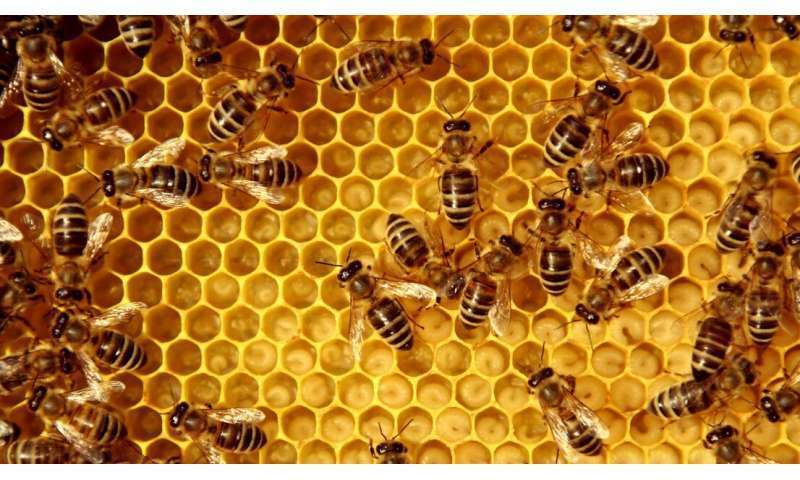 A beekeeper teamed up with the Signal Processing Laboratory 5 and a group of EPFL students to develop an app that counts the number of Varroa mites in beehives. This parasite is one of the two main threats – along with pesticides – to bees' long-term survival. Knowing the extent of the mites' infestation will allow beekeepers to protect their bees more effectively. Bee populations are succumbing to a number of dangers, led by pesticides and a particular kind of parasite known as Varroa mites. These parasites can be found on all continents except Australia. They attach to bees, weaken them and end up killing them. "This parasite is the leading cause of bee deaths," says Alain Bugnon, a local beekeeper. "Left untreated, the hives won't last a year." If beekeepers could monitor Varroa mite infestations, they would be able to treat their hives at the right time and save their bees. Bugnon came up with the idea for an app that would provide this information, and teamed up with EPFL's Signal Processing Laboratory 5 (LTS5) to create it. Beekeepers currently assess infestations by counting the number of dead mites that land on a wooden board placed below the hives. But this technique is not very accurate: the parasites are barely a millimeter long, and their bodies get mixed up with waste and other material on the board. The process is also time-consuming, especially if a beekeeper has several hives. This was the challenge presented to the students in LTS5, a lab in EPFL's School of Engineering run by Professor Jean-Philippe Thiran. The students came up with a system – consisting of an app linked to a web platform – that uses artificial intelligence to quickly and automatically count up the mites on the boards. This means that beekeepers can keep close tabs on infestations in order to target their treatments, which are in keeping with Swiss organic farming practices. The technology developed by the LTS5 students streamlines the beekeepers' task. They still need to put wooden boards under each of their hives, but now they simply photograph the boards and upload the images to the web platform. To develop their app, the students used machine learning – scanning thousands of images into a computer – to teach their program how to recognize the mites. The app can spot and count the dead parasites on the board in just seconds. "The first step was to create a database of images of Varroa mites for the computer, so that it could recognize the mites on its own and without making mistakes," says Maxime Bohnenblust, a Master's student who has been involved in this project from the start. Several beekeepers regularly submitted photos of their boards to the laboratory and gave the students feedback on their results in order to help them improve the algorithms. The students overcame several hurdles in coming up with their solution: photos taken with smartphones are often not very clear; the light in photos taken outside is very bright; and each board has to be associated with a corresponding hive. In response to the third hurdle, the students programmed their app to generate a specific QR code for each hive. A beekeeper using the program then takes a picture of his board alongside the QR code for his hive and uploads the image to the platform, where it is immediately analyzed. The results – how many mites are detected – are stored and will be used to create statistics and a time profile. This system will also make it possible to compile nationwide data in order to produce statistics. No other system of this sort – based on standardized data – currently exists. "The beekeepers didn't have any shared metric or standard," says Bohnenblust. "And until now, beekeepers associations have been sending their data to Agroscope, the Swiss government's agricultural research center, once a year." Yet if there is to be any chance of saving the bees, timely data is required. "Anti-parasite treatments must be applied at the right time and scaled to the size of the infestation," says Professor Thiran. Finally, the collected data could be used to map out and track Varroa infestations in Switzerland and potentially identify parasite-resistant strains of bees.